After a scathing report came out detailing dysfunction in Green Bay, particularly between Rodgers and former head coach Mike McCarthy, Rodgers returned fire, calling the article a "smear report" and calling out the former teammates who were quoted, in particular Greg Jennings and Jermichael Finley. It's turned into a "he said, she said," with responses, denials, accusations, questions, etc., flying about. How Rodgers looks in all this is an "eye of the beholder" situation. 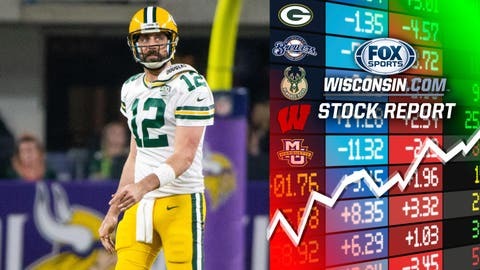 Either he's not a leader and people called him out properly or you believe Rodgers and the entire thing is a farce and the result of bitter ex-players. Likely, it's somewhere in between, but it sure has spiced things up in Packerland. After allowing baserunners in back-to-back games (heaven forbid! 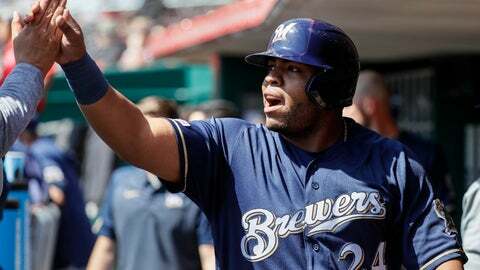 ), Hader faced eight batters against the Cubs on April 7 and retired all eight. It marked Hader's second game this season in which he notched a save while pitching at least two innings. He had seven such saves in 2018. Only John Axford, with two, has multiple 2+ inning saves since 2010 for the Brewers. Cincinnati's Raisel Iglesias, with 10, is the only major-league pitcher with more 2+ inning saves than Hader's nine over that span, and the Reds' reliever hasn't had one since 2017. 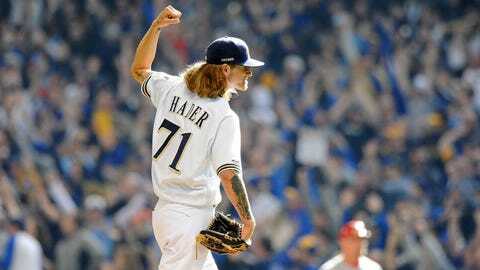 Oh, and Hader has allowed just one hit and one walk this season in 7 2/3 innings, with no runs allowed and 13 strikeouts. Let's face it, he's the best reliever in baseball. The regular season is finally coming to an end. 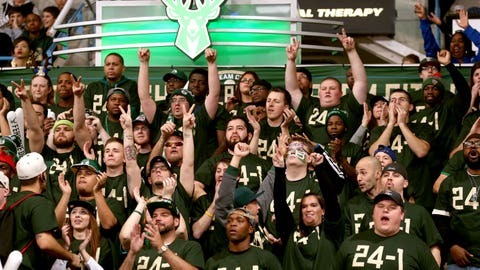 It's been a fun ride, but the past few weeks seemingly have just been about Milwaukee getting healthy and holding onto the No. 1 seed. The anticipation for the postseason has been building, and now it's just days away as fans are hopeful for a deep playoff run -- and finally getting past the first round, which hasn't happened until 2001. We expect Fiserv Forum to be rocking come this weekend. You're seeing why Milwaukee went out and signed Grandal this past offseason. 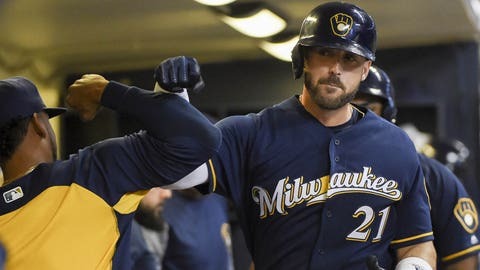 The veteran is an offensive upgrade at catcher, as he proved this past week by going 8 fpr 14 (.571) with a double and three home runs, including two Tuesday night against the Angels. On the young season, Grandal is hitting .364/.389/.667 in his 10 games. We mentioned Aguilar last week with his stock going down and quite frankly things have gotten worse. 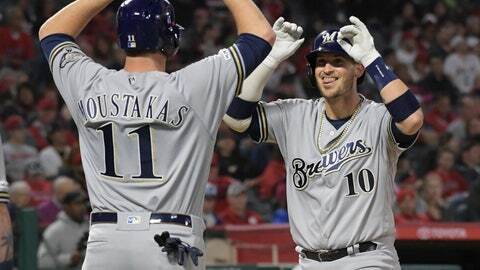 Appearing in five of Milwaukee's six games, Aguilar was hitless, 0 for 16, bringing his average down to .111. In 36 at-bats and 44 plate appearances, he's still searching for his first extra-base hit. Another Milwaukee corner infielder who is scuffling is Shaw. In five games last week, Shaw was 1 for 21 (.048) with 10 strikeouts. He's hitting just .154 in 11 games with one extra-base hit, a home run. 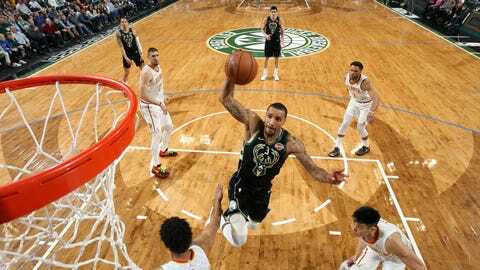 Since coming over from Cleveland in a three-team trade back in December, Hill, when healthy, has been mostly a complementary piece for Milwaukee. From his first game with the Bucks on Dec. 10 until March 28, Hill averaged just 19.7 minutes and 5.6 points per game. But since March 31, Hill's playing time, and as a result, production, have picked up. In Milwaukee's last five games, Hill is averaging 26.1 minutes and 16.6 points per game, while shooting 52.7% from the field. Last Thursday, he played nearly 33 minutes, his high with Milwaukee. Like Hill, Ilyasova has been a role player all season. Except with the playoffs nearing, his game is going in the wrong direction. 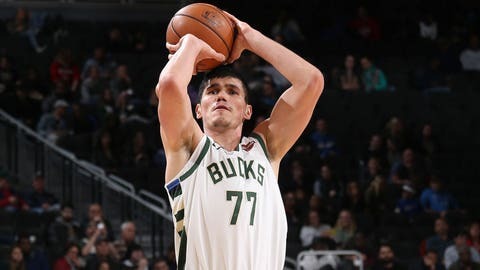 In three games last week Ilyasova shot just 30% from the field, including hitting only 2 of 9 3-point attempts.